World-Heritage listed Barmah Wetlands aboard MV Kingfisher. Kingfisher travels the narrowest section of the Murray River, between Albury and the ocean called the ‘Narrows’ or the ‘Barmah Choke’ where the river travels at almost twice the normal speed. The Murray River here separates Victoria’s Barmah National Park from Moira, Millewa and Gulpa Forests in New South Wales - combined the area ranks as the world’s largest stand of River Red Gum. It is a wildlife haven for 236 bird species, 50 mammals and more than 500 plant species. When water levels allow the two-hour cruises also explores the Barmah Lake and a short land excursion is often included along the way. 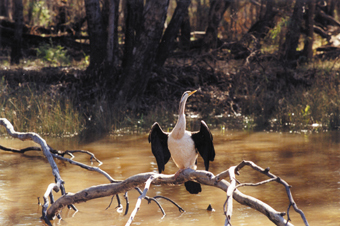 Hear fascinating commentary form your certified eco guide about the hundreds of species of water birds, animals and native fish that have made the Barmah Wetlands and Forest their home, and about myths and legends of this very special area.